Home » News » SYCF wins BR Chamber Business Awards Charity of the Year! 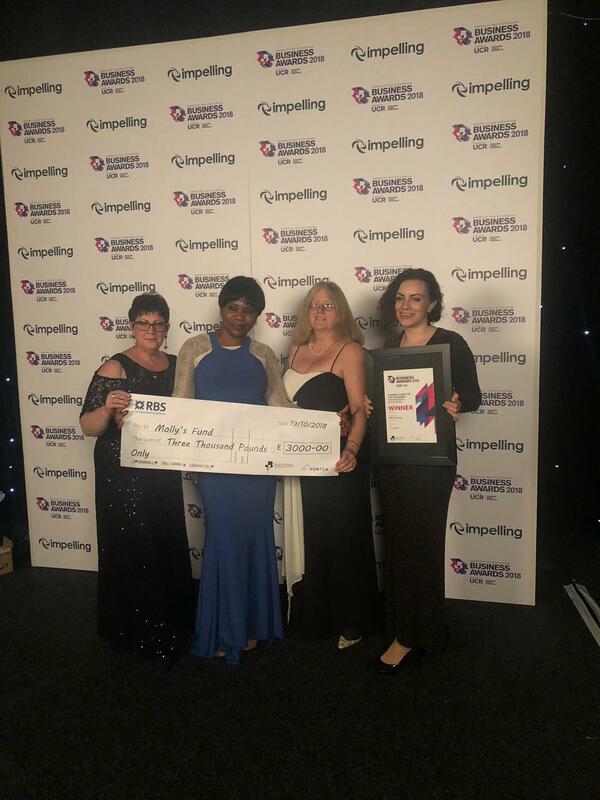 We are honoured to have won Charity of The Year at the 2018 Barnsley & Rotherham Chamber Business Awards, in support of our Young People’s Health and Wellbeing Fund, In Memory of Molly Hurst. The fund was set up last year in partnership with Molly’s parents, who lost Molly to suicide at the age of 22 in 2017. The fund aims to raise money to support the community organisations and charities in our region, providing much needed support to young people struggling with their mental health. The £3,000 prize was go directly into the In Memory of Molly Hurst Fund and will help us reach our fundraising goals for supporting these organisations with grant awards. CEO of SYCF, Ruth Willis said: “We are absolutely thrilled. This prestigious award will enable us to raise awareness of the ongoing work of South Yorkshire’s Community Foundation and of Molly’s Fund. “Our commitment as a charity is to everyone in South Yorkshire, to all those individuals and organisations supporting people across our region and an important part of that commitment is responding to local needs. SYCF set up The Young People’s Health and Wellbeing Fund, better known as Molly’s Fund, with the Hurst family after Molly took her own life at the age of 22. The fund supports the much needed mental health and wellbeing organisations for young people in our communities, to help put a stop to these preventable deaths. To find out more about the In Memory of Molly Hurst: The Young People’s Health & Wellbeing Fund, click here.